400 square meters of equipped service areas, including kitchens and numerous back office areas. The Villa is always offered for the exclusive use of the client and their guests. Villa Corsini is surrounded by a beautiful landscape of olive groves and vineyards. 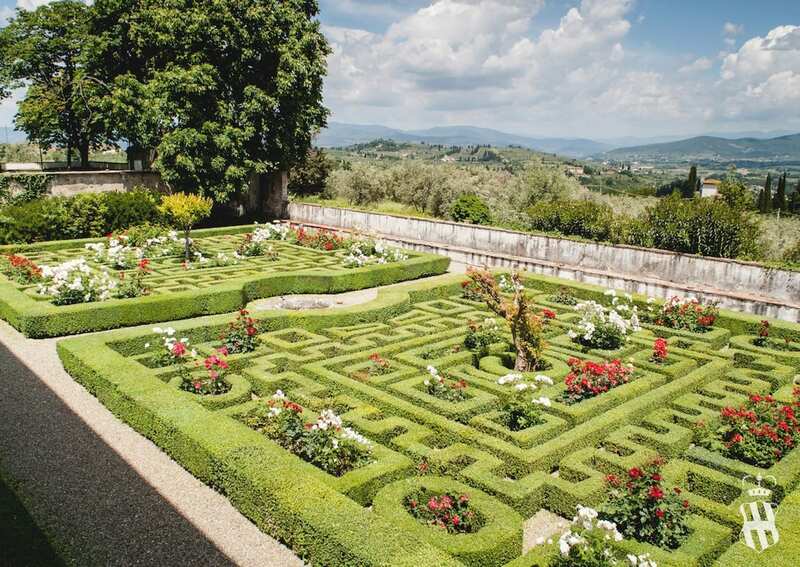 It is only 7 km from Florence and it offers to its guests 4 wonderful historic gardens on 20,000 square meters of land. 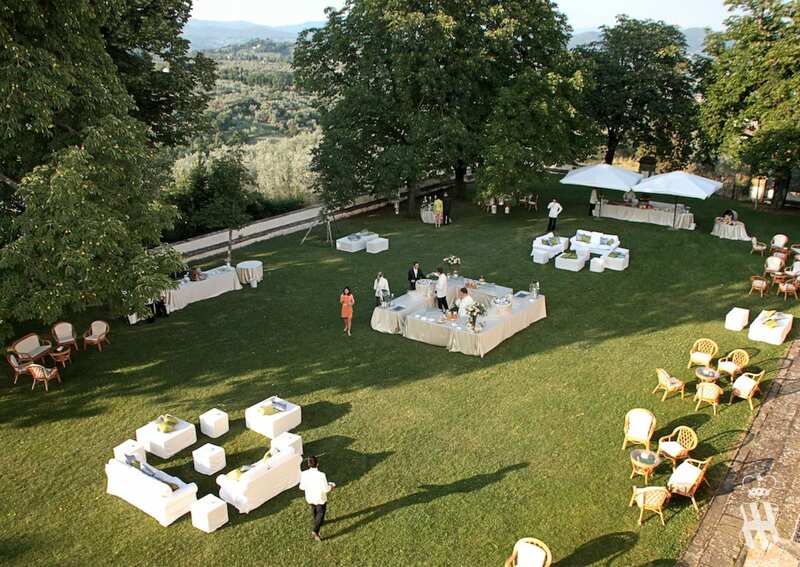 In a unique setting, surrounded by the lively silence of the Tuscan countryside, the green spaces are arranged from North to South. 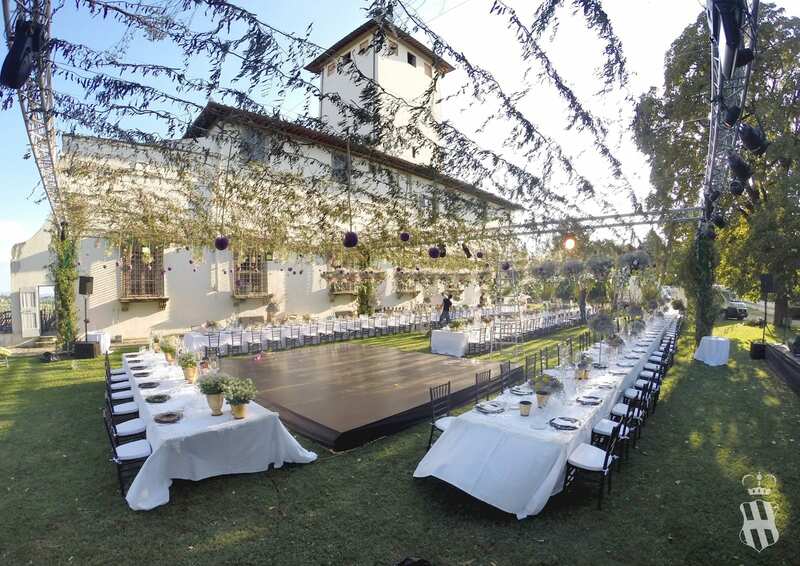 So the client and their guests can enjoy both romantic sunsets among flower and fresh moments of relaxation in the shade of centuries-old trees. 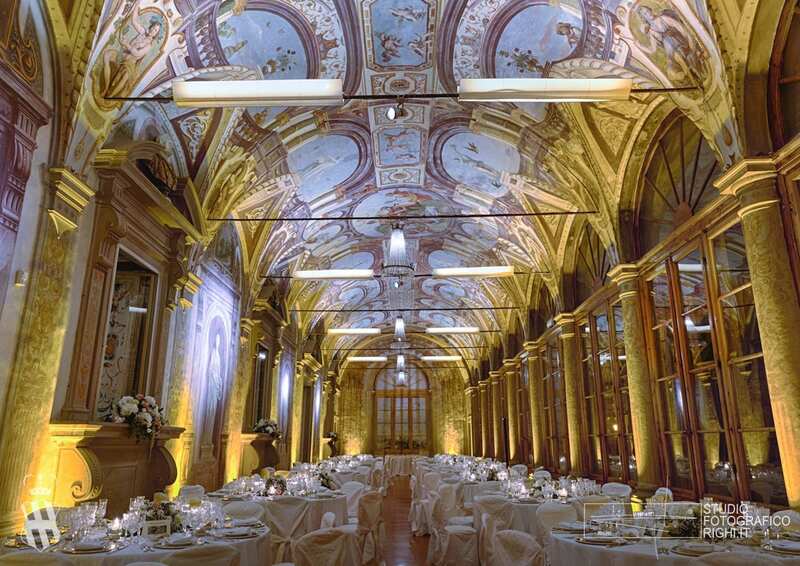 Villa Corsini, managed by Corsini.Events Group, is exclusively offered to the client and his guests. The list of external environments can be viewed by scrolling down the page. The English Garden is particularly suitable for large outdoor events, aperitifs and relaxing afternoon activities. Fresh and shaded thanks to the extraordinary variety of ancient trees, this space is ideal for events in which is preferred a more informal style and setting. 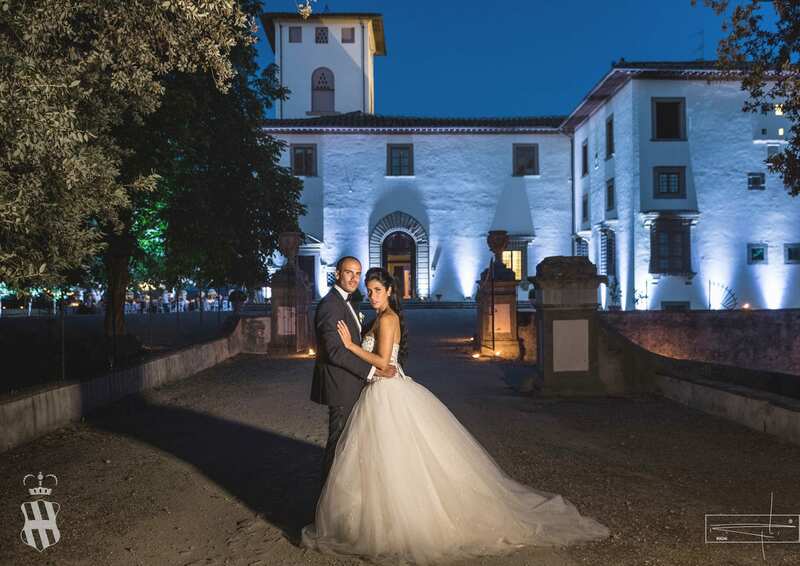 Its characteristics make it suitable for groups of very numerous guests as well as for individual photographic shootings and a smaller number of guests. The two Italian gardens of the villa offer a wonderful window over the Chianti area. The “garden of Meridione” provides a wonderful opportunity to host ceremonies and aperitifs between rose gardens and boxwoods. Embellished with statues and vases in ancient terra cotta, typical of Impruneta craftsmanship, this example of hanging garden is characterized by a fountain of water lilies, around which there are four flower beds. The “Pizzughe garden”, which overlooks the frescoed gallery, is the most beautiful among those designed by Prince Giovan Carlo de ‘Medici himself. 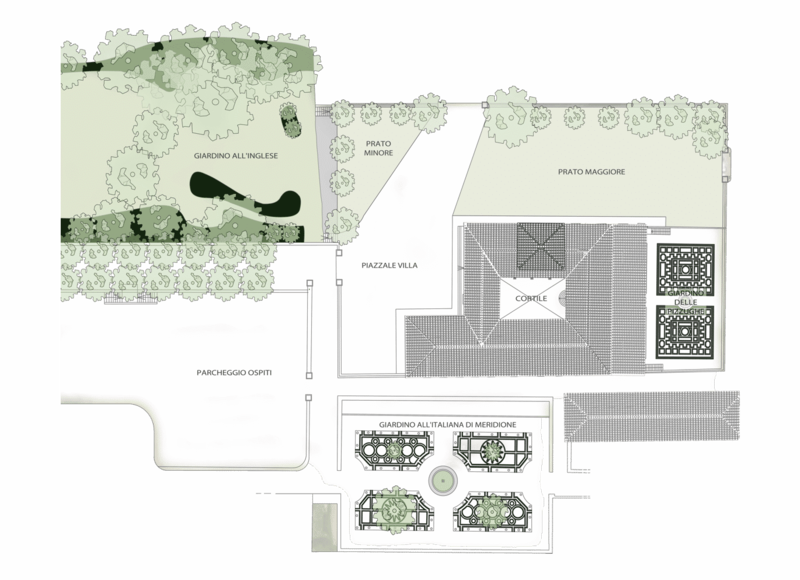 The green space respects the canons and style of the typical Italian Renaissance gardens, with its boxwood and rose gardens geometries. The lawn is protected around its perimeter by huge walls and century-old chestnut trees. It continues on the north-west of the villa and overlooks the rolling hills of the Tuscan countryside. It offers the possibility to assemble one or more tensio-structures, suitable for every need of the guests. Its position is optimal even in anticipation of fireworks. The entrance square, is ideal for the performance of actors and entertainers, as well as to create effects of video-mapping on the facades or to reserve a special welcome to the guests. 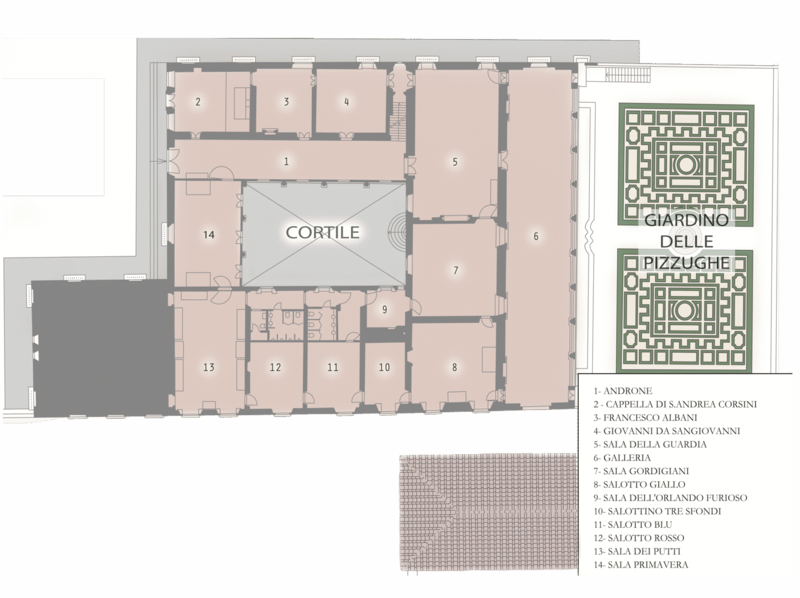 The internal spaces of Villa Corsini allow to live a unique experience. That one of sharing for its own event, the history, art and culture of an extraordinary Region. Guests can choose between different indoor environments, which are perfectly adaptive according to the number of guests. From the Sala del Gordigiani to the Salotti di Meridione, passing the Sala Primavera or the Salone dei Putti, the interiors allow you to have excellent solutions always: even during the winter season or in case of bad weather. Without forgetting to mention the famous Gallery: one of the most impressive frescoed hall in Tuscany, frescoed in 1631 by Pandolfo Sacchi and Domenico Cresti known as "Il Passignano". The multiplicity of spaces allows an ideal organization of the event. From lunch to dinner or for an aperitif, small and large groups find the right dimension respecting the intimacy of the guests. 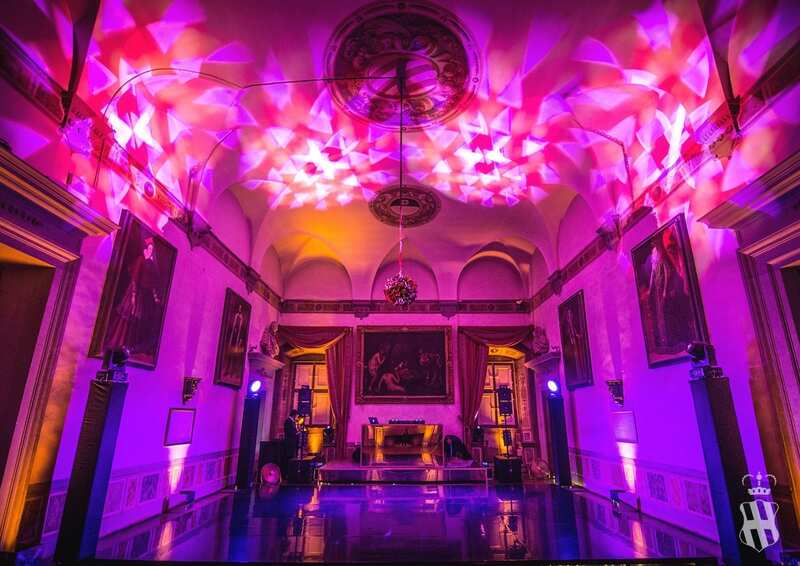 Villa Corsini and Corsini.Events Group offer the same high level of professionalism for corporate events, private events, presentations or other celebrations. 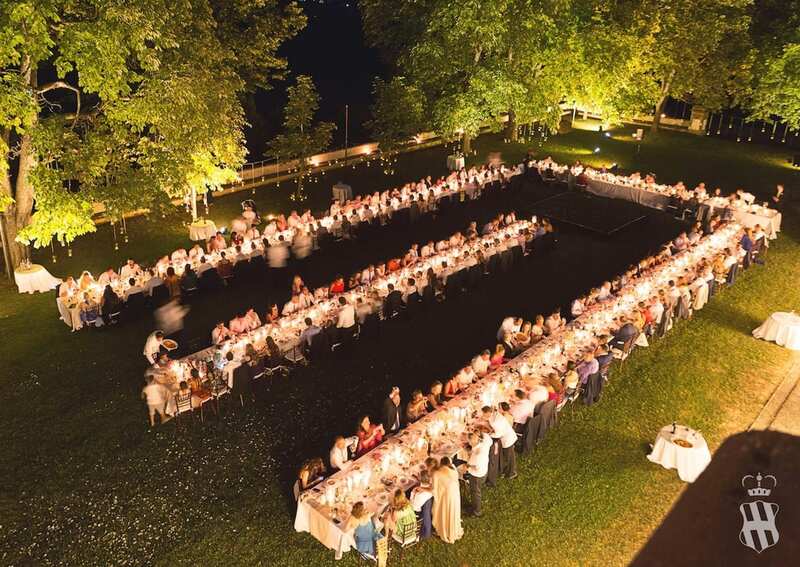 All the guests will receive the perfect and custom-made support to realize all kind of events. The Gallery is one of the most impressive frescoed rooms in Tuscany. Thanks to the beauty, flexibility and capacity, this space is absolutely unique and special in its kind. 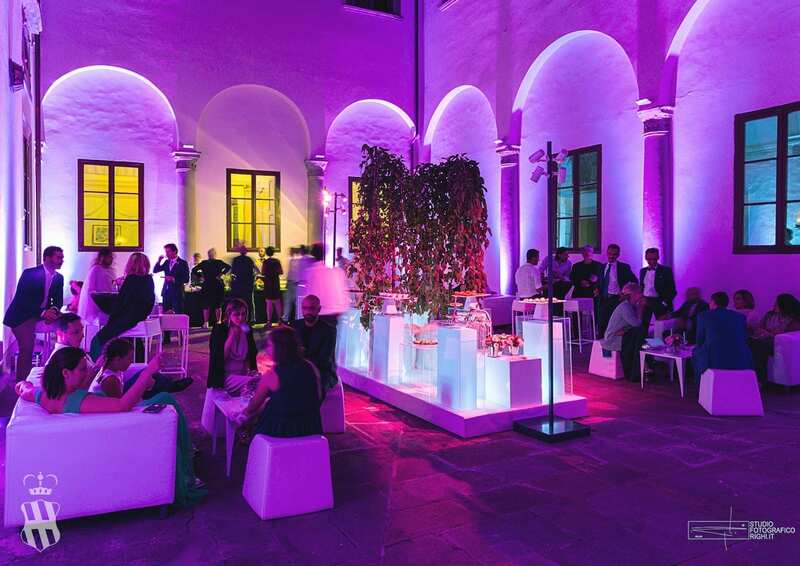 Thanks to a size of over 215 square meters, the Gallery meets the needs of events of all kinds. Overlooking the Italian Garden and the Chianti countryside with its many big windows, the Galleria offers a splendid show outside, but not only. The frescoed walls show the 4 female allegories: Poetry, Painting, Music and Medicine. While the surprising roof depicts a tribute to the rural deities and to Cronus, God of Time. Passing from the entrance hall, with its imposing door and the vaulted cross-vaulted ceiling, you reach the Salone della Guardia. The attention of the guests is captured by multiple elements. From the ceiling decorations depicting the three coats of arms of the Medici, Panciatichi and Corsini families; and by the presence of a monumental stone fireplace in perfect condition. Parade, Lounge Room, Aperitif, Lunch or Dinner, Open Bar, or even spacious ballroom, the Salone della Guardia is able to meet the multiple needs of the Villa’s guests. 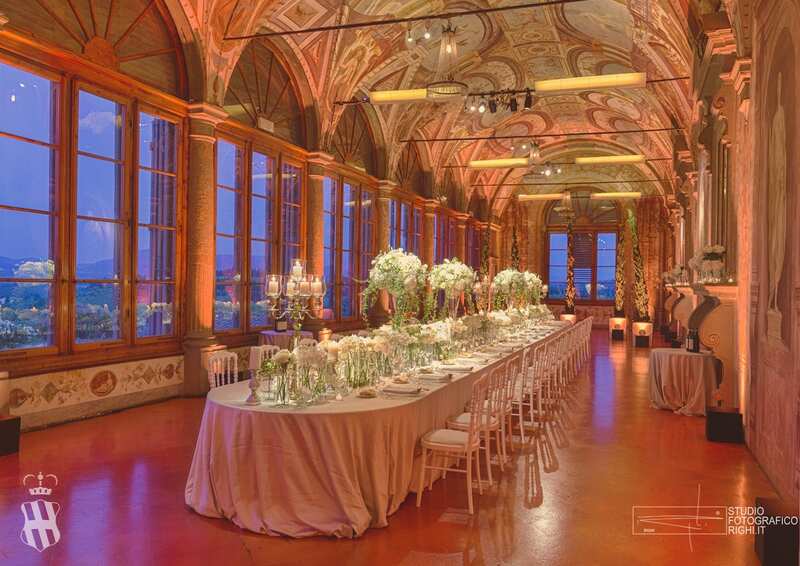 In case of bad weather or rain, Villa Corsini excels in the ability to immediately adapt to the needs of the event expected. A record due to the purpose of his birth: a Villa for celebrations and parties. The Yellow Living Room “Salotto Giallo”, with its frescoes dedicated to “Cupid and Psyche” is the fourth of the monumental Salons and is connected to both the Gallery and the “Saloni di Meridione”. There is also the “Sala Primavera”, lit by 4 large windows overlooking the courtyard and frescoed with floral patterns from which it derives its name; that of Putti, characterized by frescoes of children – Putti- portraits while having fun in typical Renaissance games; the private salons and “saloni di Meridione”, finally close the architectural ring that revolves around the large courtyard of the villa. All the interiors have been designed to host events, ensuring uniqueness and flexibility even during the winter season.